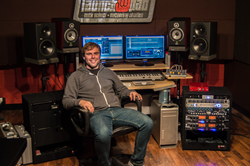 The Launch Pad, an Indianapolis, IN rock school and recording studio that’s co-owned by SAE Nashville Audio Technology Program graduate Ryan Freeman, just celebrated its two year anniversary. Launch Pad is a destination for both professional studio clients from across the state as well as young aspiring rockers who live in central Indiana. The Launch Pad, an Indianapolis rock school/recording studio that’s co-owned by SAE Nashville grad Ryan Freeman, just celebrated its two year anniversary. As soon as I attended an open house event at SAE Nashville, I knew that it was the right school for me. When I graduated, I felt like I could go into any studio and run sessions comfortably and confidently. Freeman grew up in a musical family. He learned how to play the bass guitar at nine years old from his father, a professional bass player who performed and recorded with contemporary inspirational performer Derek Loux. Freeman added drumming to his musical repertoire when he was 12, and eventually developed his skills on guitar and mandolin. He played in church bands in middle school and a metal band in high school. Freeman’s interest in audio technology and music production was kindled while spending time with his father at Loux’s recording sessions. He was fascinated by the engineering process, and used digital recording equipment that he received as a gift from Loux to produce local bands in his garage.